On 18/09/2018 at InterContinental Landmark72 Hotel, Hanoi, Vietnam Software and IT Services Association (VINASA) have launched Vietnam’s 50 Leading IT Companies 2018 programme and presented “Vietnam’s 50+10 Leading IT companies 2018” book as well and shared the “Journey” of the publication over the years. The programme, the fifth of its kind, has improved to encourage businesses to actively participate in digital transformation as well as drive the enterprises to adopt with global technology trend, especially in the background of the Forth Industrial Revolution. In addition to the "standard" criteria such as: human resources, markets and customers, technology and products, revenue growth, business management, etc. This year's voting program also focuses on detection the "spotlights" which are outstanding enterprises of 4.0 technology capability, through the products - solutions using new technologies (artificial intelligence - AI, Internet of Things – IoT, Big Data, Blockchain ...) to solve the existing "problem" in society. After evaluation and assessment their business practice, these members of the Council who are IT professionals, business management professionals, and representatives of press agencies, have voted to evaluate, review and finalize the final list of 53 businesses in 2 groups: 50 leading IT Companies and 10 outstanding Companies of 4.0 industry. These companies are all strongly growing and have ability to impact to development trend of the market and IT sector in Vietnam. 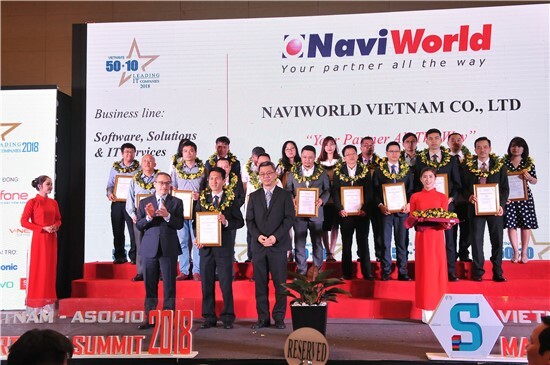 This is the second year NaviWorld Co., Ltd (NaviWorld Vietnam) submits to this programme and has been honored as one of the leading Vietnam enterprises in the Software, Solutions and IT Services sector for 2 consecutive year. As being the Gold Certified Partner of Microsoft, NaviWorld Vietnam is a leading provider of business management solutions Microsoft Dynamics ERP / CRM to businesses in Vietnam and the Southeast Asia. Our foundation are values ​​and long-term consistency, teamwork and dedication to the job, NaviWorld always offer value to customers through our commitment to quality, innovative IT solutions tailored to meet the evolving needs of the growing business domestic and foreign enterprises. Information about NaviWorld Vietnam will appear in the publication "Vietnam's 50 Leading IT Companies 2018" compiled by 3 languages ​​(Vietnamese, English and Japanese) to promote and introduce the companies brand in countries and territories worldwide.